Al Mar SERE Attack II mircarta front-lock knife. It is mint in the box with the original sheath. 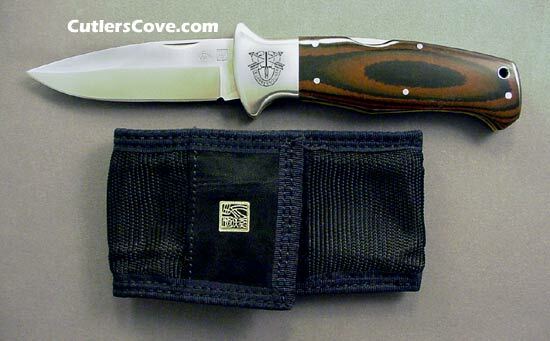 Al Mar SERE Attack II Micarta front-lock. It is mint in the box with the original sheath. The blade is 3-1/2" and it is 4-1/2" closed. Model 3002A. It has the United States Army Special Forces chest "DE OPPRESSO LIBER" on the bolsters which is Latin and means To Liberate the Oppressed. 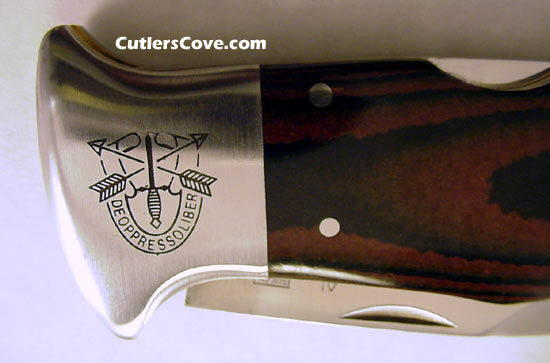 It has brown Micarta handles (Al Mar called this handle material Camo green Micarta) and large stainless bolsters with a shaped guard as part of the bolster. It comes with the original nylon sheath. This is the mid size SERE and we have the other two sizes also. Get it before it is gone, these are not in production! Initiated by Colonel Nick Rowe, creator of the Special Operations Command's SERE (Survive, Escape, Resistance, Evasion) School at Fort Bragg, North Carolina, the SERE became the first truly full-sized folder capable of meeting the stringent demands required in combat/survival situations. This is the mid size SERE and we have the other two sizes also.